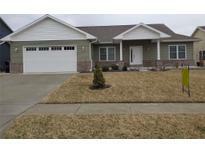 Below you can view all the homes for sale in the Auburn Meadows subdivision located in Lebanon Indiana. Listings in Auburn Meadows are updated daily from data we receive from the Indianapolis multiple listing service. To learn more about any of these homes or to receive custom notifications when a new property is listed for sale in Auburn Meadows, give us a call at 317-434-3975. Brand new fence enclosing the entire backyard. MLS#21627905. RE/MAX Ability Plus. This is not a drive by; it's a MUST SEE! MLS#21626291. F.C. Tucker Company. Basketball Goal and Water Softener are excluded. MLS#21623376. F.C. Tucker Company. Includes all of Majestic "Standards" including lawn irrigation, front sod, water softener, water purification and much more. MLS#21618121. F.C. Tucker Company. Finished 3 car garage with overhead storage and all of Majestic Standards included. MLS#21615401. F.C. Tucker Company. Home includes all of Majestic "Standards" including lawn irrigation and front yard sod. Come see the Majestic advantage. MLS#21615386. F.C. Tucker Company. Includes all of Majestic "Standards" including lawn irrigation, front sod, water softener & more. MLS#21615216. F.C. Tucker Company. Home includes all of Majestic "Standards" of lawn irrigation, front sod, water softener & much more. MLS#21614707. F.C. Tucker Company.